Diamond Plate your floors, walls, and more with Koffler''s solid Metal Tiles and Sheets! These high quality, commercial grade solid aluminum diamond plate and stainless steel sheets and tiles are incredibly versatile. Great for creating distinctive and functional wall coverings, wainscoting, backsplashes, flooring, table and counter tops, doors, etc. Easy to install. Available in two styles: self-adhering peel and stick or trowel-able. These Diamond Plate Sheets and Tiles are easy to clean, resistant to oil, grease, petroleum products, antifreeze and most household chemicals. For Commercial, Institutional and Residential use. Available Thicknesses: .045", .063", .080", .125", .250"
Tile / Sheet Sizes: 12" x 12", 24"x24", 24" x 48", 24" x 96", 24" x 120", 48" x 48", 48" x 96", 48" x 120"
Perfect for shop, garage, kitchen, industry, retail spaces, garages and more. Tile/Sheet Thicknesses: .045", .063", .080", .125", .250"
Cut with a jigsaw, circular caw or band saw and use a cutting blade designed for sheet metal (with fine teeth). Note: this product is typically installed without grout, and therefore any minute differences in tile size can stack up over distances. It is recommended to use the largest tile size possible when covering a larger area to avoid dimensional stack up problems. Can I get an 8" radius bend to wrap around front of trailer? Thank you! Are your diamond plate sheets solid sheets with cast treads or embossed? When using the diamond plate as wainscoting do they make a trim piece for the top edge to finish it off? We have converted a garage-turned family room - into a parking area for the Harley's. We painted the walls half orange half black and would like to use this as a border between the colors. The wall has somewhat of a texture to it. Would you recommend the regular peel and stick or the non stick and use of adhesive? Thanks! 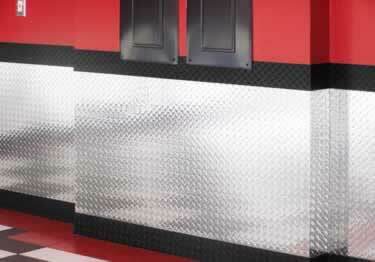 I want to use the 48" diamond plate panels for wainscoting in my garage. How do I make these panels fit the corners and will I be able to cut them when the panel reaches the door to the house? Do I bend them or cut the when I reach the corners on my garage? Can I use this outside as flooring to cover an ugly cement porch? I would need a 4x8 sheet and planned to just lay it on top of the cement. My company is a design & fabricator for Retail fixtures. We are working with a national customer (1300+ locations) to create new front service counters. They'd like to use a diamond plate "type" material for some of the counters and accent areas. I'd like to get a few samples of your product to see if it could work for our application. When installing the 48" diamond plate panels for wainscoting how do you handle inside and outside corners? I want to cover some slight damage to the front of a travel trailer. the sheet would need to be flexed to match the curve of the trailer. will your sheets work ? Hi Charles - yes, the diamond plate in the .045 thickness will conform to a curve. Hi, Do diamond self stick plates stick on concrete walls? Diamond Plate Sheets and Tiles come in a variety of sizes starting from 12" x 12", and going up to 48" x 96". Also available in select colors. Just peel and stick to any wall and create a breath taking wainscoting or backsplash. I used these panels for our gym and it is above the quality you can buy at the big box hardware stores and at a cheaper price. Keep up the hard work! Thank you for your review. We very much appreciate the compliments concerning our price and quality compared to the big box stores. We will for sure keep up the hard work, it's proven successful for over 60 years. I used 6" diamond plate base all around my 24' x 30' garage with an oil change pit, and some diamond plate sheet in the corner where the ladder and gate goes down to the basement/pit. Really pops with the industrial yellow stuff! The Liquid Nails is holding up great, and I had enough base and glue left to do my boiler room, and the one wall in my storage room that isn't hidden by storage racks. Thank you for your review. We very much appreciate the details you provided concerning how the product looks and the ease of installation. Diamond plate sheets were just what we needed and applied easily! uses. I used these on an enclosed trailer that was damaged by rocks thrown up by my truck when trailering. I will attach photos to email? The tiles were exactly as advertised, but look even better in person! Staff was friendly and very willing to answer my questions. Product arrived faster than expected. Highly recommended! Thank you for your review � we really appreciate your feedback. Normal lead times are 5-7 business days for our diamond plate; however, circumstances beyond our control (a Union strike) extended our lead times for a short period of time. I�m glad you�re happy with the product and hope you get lots of use from them! First of all, my order took 3 weeks to get here, way beyond the time they quoted me. It was due to come 4 days before I needed it, but it arrived 8 days AFTER I needed it. So a word to the wise, if you need it by a deadline, order expedited shipping because the shipping estimation times are wrong as listed on their calendars. That being said, once it did arrive it exceeded my expectations. The tiles come wrapped with a protective peel-off coating so that they don't scratch during transport. They are bright and shiny, and the stick-flat nature of the tiles make them easy to use. I am a caterer, and I am going to use them to line the top of a buffet so it looks more masculine. I was going to use them for two different events, but since they didn't arrive for the first event, I will only get to use them at the second. My client is very excited to see them on his buffet, and I am too. I haven't installed the Diamond wall sheets, but they were delivered very quickly and were excellently packaged Looking forward to installing them. The support staff was very helpfully and were good enough to quickly send me samples of the product before I purchased it. Detailed description of product and pictures helped also.